Chris Spielman was a high school and Ohio State football legend and a four-time Pro Bowl linebacker, but he didn't tackle his toughest opponent until his playing career was almost over. 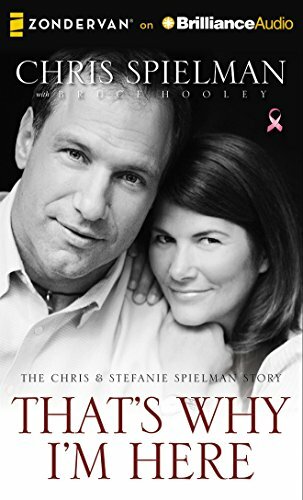 In 1998 his wife Stefanie was diagnosed with breast cancer, and so began an 11-year journey that brought joy and suffering to the Spielmans, as well as hope and inspiration to thousands of others. In That's Why I'm Here, Chris traces his storied career, recalls his courtship of Stefanie Belcher, cherishes the growth of their four children and invokes the deep spiritual faith that gave their family wisdom and comfort in times of struggle. Known for his intense play on the field and his spirited commentary as an ESPN college football analyst, Spielman now brings that same passion to the page—with the help of acclaimed journalist Bruce Hooley, a co-host on their popular Columbus morning radio sports show. Though there are plenty of on-the-field tales in the book, it's not just for football fans. It's for people whose lives have been touched by cancer, for people whose own faith has wavered, for people who want to meet a woman of tremendous beauty, grace and strength. Though Stefanie passed away on November 29, 2009, her memory and inspiration live on. With laughter and tears, joy and heartbreak, this audiobook lets you know her spirit is still here. If you have any questions about this product by Zondervan on Brilliance Audio, contact us by completing and submitting the form below. If you are looking for a specif part number, please include it with your message.